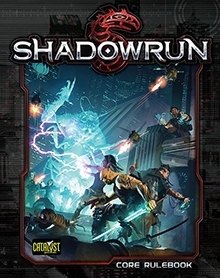 Welcome to Part 1 of the Featured Product series for Shadowrun (5th Edition) published by Catalyst Game Labs. Part 1, Cover to Cover, discusses the brand new core rulebook from a newbie’s standpoint. This is not a Featured Product series comparing the 5th Edition to previous editions, it is a delve into Shadowrun for those who know little or nothing about it. Before you delve into this new edition of the Shadowrun core rulebook, you need to know that it’s a HUGE book. You could easily call it a massive tome. Now, unlike some other large core rulebooks, magic doesn’t consume 25% of its interior. No, Shadowrun is very involved, with lots of meat. Think about this: your average fantasy RPG discusses melee and ranged warriors and spellcasters; your average sci-fi RPG discusses high-tech weapons and psionics. Shadowrun takes pieces from so many angles, that it’s no wonder it’s so big. You no only get melee warriors, high-tech weapons, and spellcasters, you also get technomancers, deckers, riggers, and the matrix. It’s a lot of subjects to discuss and requires a lot of space to discuss it. But with a sense of value, this 5th Edition core rulebook gives you everything you need to play pretty much every major aspect of Shadowrun without needing a separate core supplement or sourcebook. The only drawback, or at least one drawback, is that you get a very large book with a lot of content to read to understand how all of it works and how all of works together. Another piece of good news is that Catalyst Game Labs is not re-writing the rules for Shadowrun, they are simply cleaning them, altering what needs altering, or improving on what’s necessary [see our interview here with Shadowrun 5th Edition line developer Jason Hardy for more information]. Thus, those familiar with Shadowrun will not have to relearn their games. They will not have to run out and replace every single book they have. Those who are new will be happy to know that content already available is usable with this new edition; meaning you don’t have to wait to launch into a campaign. However, I will go back to noting that this book is thick, dang near able to stop a bullet, and will take time for the newbie to consume it all. It is thus that as I launch into this Featured Product series, I warn that Shadowrun is not for those who want a quick game. It is not for those who want few options and a way of minimizing mechanics. It is a mechanics-heavy game simply because of all its technological options (due to its cyberpunk genre) and requires work from all parties to properly understand. I recommend the GM reading through the core rulebook thoroughly and then discussing character creation as a team, not as individuals. For newbies that is. For the experienced, you should be able to dive in with both feet and get moving along quickly! For those who are new, you may want to tread lightly and let the GM guide your way. I also recommend every player read through all sections regarding the setting and character creation. If you wish to play a particular character, you’ll want to read through that section too. I say this because the setting is extremely tied to the Shadowrun mechanics mainly in terms of the matrix, metahumans, and why magic is prevalent. A good place to start is the new Quick Start Guide, but I’ll discuss that in a subsequent part of this series. What about the cyberpunk? What about the technology involved in Shadowrun? Honestly, it doesn’t seem as important as many other aspects of the setting and the system. Not that cybernetics are not an integral part of Shadowrun, but rather there are so many aspects of the setting that cybernetics seem minor in comparison to the matrix or the existence of metahumans and magic. Yes cybernetics are common, but I don’t see Shadowrun as a game that focuses on a new evolution of humans where cybernetics are dang near implanted at birth and everybody is so augmented that humans look more like robots than humans. Think of it as shadowrunners utilize cybernetics to get a leg-up on their competition or targets. That’s how the cyberpunk aspects of Shadowrun feel to me. In the end, Shadowrun is the type of setting that ultimately will feel how you want it to feel simply because there are so many components that can be incorporated in varying degrees. You could have a heavily augmented team wander into an area where children receive their first augmentations at the age of 5. Or you could only allow one or two augmentations as special devices for the elite, and the rest of the focus is on the magic. You could even take Shadowrun in a completely underground way where little of either one exists and the characters primarily rely on their wits and their brute strength. I don’t think you can break the game one way or another by adjusting the influence of these different aspects. Just remember, though, you’ll spend a good amount of time reading through this core rulebook to take in all these various aspects and figuring out how each one is going to be incorporated into your adventures and campaigns. In fact, I recommend reading through parts of it twice, such as the explanation of the matrix, just to fully understand the mechanics and fluff behind them and allow you (the GM of course) to seamlessly weave them into your adventures and campaigns. The Shadowrun 5th Edition core rulebook is a great looking book. It has fantastic artwork, a great layout, and is a very smooth read. It does, however, have a lot of sidebars, charts, examples (possibly too many), and fictional inserts. It could be scaled back in terms of page count by getting rid of some of the bulk, but overall the book is very thorough. Not only do you get great illustrations to look at and interesting fictional pieces to read, but you get a lot of great content that reads smoothly. In all honesty, I wouldn’t expect any less from Catalyst Game Labs and a role-playing game that’s been around as long as Shadowrun. For $60 in printed format, you are definitely getting your money’s worth. The only thing of this entire book I don’t like is the character sheet. The character sheet is mostly in red and contains a lot of poorly utilized white space. When you print red in grayscale, it doesn’t show up very well. There’s also a lot of extra space where it’s not needed and not enough space where it would be advantageous to have. I know this seems like a very minor thing, but when I’m trying to play characters in an RPG, the usability of the character sheet is a big deal. How easily can I read what I’ve written? How small am I forced to write? How well can I read the printed parts of the character sheet? And more importantly, how well do the sections hold-up to continuous erasing? Did I mention how much I dislike the red? Because it was really hard to see when printed in grayscale. Just thought I’d throw that in again. I’ve been very impressed with Shadowrun 5th Edition’s first year. It’ll be interesting to see where they go during the course of the next five years!